The following update is from the American Academy of Pediatrics Department of Federal Affairs. 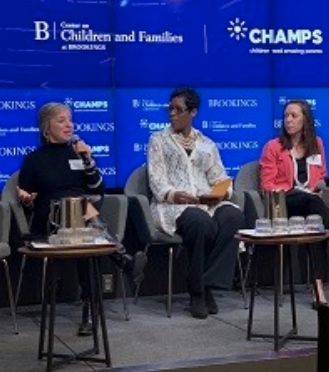 On Tuesday, WIAAP member Lisa Zetley, MD, FAAP, (pictured far left) member of the AAP Council on Foster Care, Adoption, and Kinship Care Executive Committee, spoke at a Children Need Amazing Parents (CHAMPS) convening for state child welfare agency officials and stakeholders. AAP is a lead partner for CHAMPS, a national campaign focused on improving policies promoting quality foster parenting at the state and federal level. The event focused on improving recruitment and retention of quality foster parents. Dr. Zetley spoke about how children in foster care can experience trauma that contributes to negative health outcomes and their need for timely access to health services. She also addressed the importance of foster parents having the resources to address children’s health needs.